When I was interviewed for the Valley Advocate podcast, Gina Beavers asked me what my most comfortable medium was as an artist. Since I was on camera, I couldn’t just shrug and say “iunno,” so I put a little effort into coming up with an answer. I wound up citing George Orwell’s essay “Why I Write,” which I cite pretty often because it works really well for me as an articulation of my motives as a writer. Every line of serious work that I have written since 1936 has been written, directly or indirectly, against totalitarianism and for democratic socialism, as I understand it. It seems to me nonsense, in a period like our own, to think that one can avoid writing of such subjects. […] And the more one is conscious of one’s political bias, the more chance one has of acting politically without sacrificing one’s aesthetic and intellectual integrity. And my point in bringing it up was: the project starts with the politics. It has to. I start with the point I want to make, and usually also a little bit of a nugget of story. And I make the art so that it frames that story in a way that makes my point. The form came when I was walking into the library. There’s a big wall in the gallery that’s pretty new, that a lot of people dislike. I like it a lot. It offers these big chunks of space that are clearly visible from several viewings around the library, outside the gallery. I saw the title of my show, right up in the upper left corner of that wall, where everyone would see it coming in. At that point, I started working towards arranging for my div to get a gallery show. And once I knew where I wanted to put the work, I started thinking about how to use that space so that it effectively communicated the message I wanted to present. But the gallery show only lasts a few days. That’s not a very good memetic platform: it’s fleeting, it’s hard to replicate. But virtual spaces don’t have to be either of those things and besides, there are over a dozen projects in the gallery every semester, maybe some of those artists want to be able to archive their work? I started working on a 3D model of the gallery, with the intention of reproducing my show in virtual space alongside the physical one. Due to health-related issues and some other complications (including but not limited to “I didn’t exactly know what I was doing”), that part of the project wasn’t done in time – in fact, it still isn’t done yet. But the gallery model is online at http://a360.co/2H4aZmZ, and the content of the installation is up at http://memeticengines.net. That’s where the 3D installation is going to go when it’s ready – and I’m hoping to have a first approximation up inside the next week or two. 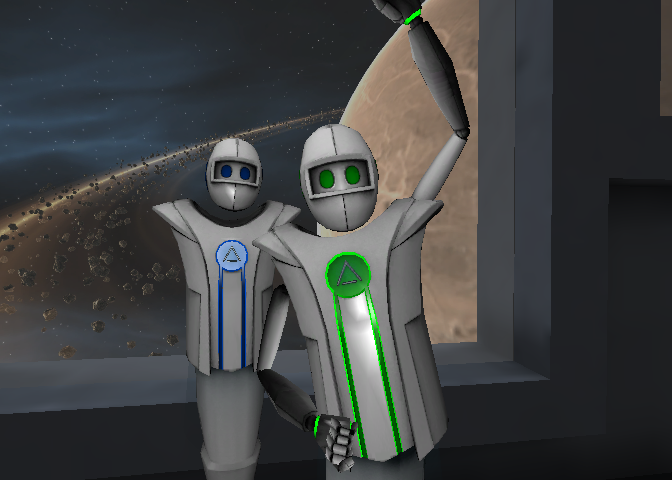 The platform I’m planning to use – AltSpace – will even let me host events, so I can show up for an opening of the digital gallery and hang around to answer questions, just like I did with the physical one.